"I've seen too many projects fail due to poorly defined and ill-managed scope. 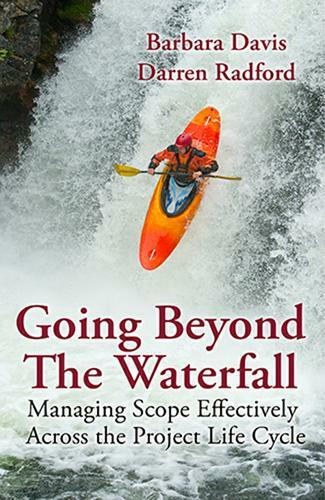 Going Beyond the Waterfall shares the best tools, techniques, and approaches to ensure you undertake just the actions that will deliver the intended value; nothing more, nothing less. This is a must read!" This book will help project teams understand how and when scope changes and evolves as a part of a living-development process by answering the ultimate question: Are we doing the right things the right way?" Barbara Davis is President of RQX Global Training and Consulting, LLC, an organization that provides technology management and profit management services for projects, resources, portfolios and IT services. She is a proven thought leader and expert in business analysis, project management, and various aspects of information technology management and business. Ms. Davis has been a champion of business analysis and technology standards and infrastructure for well over a decade, during which time she developed the worlds first university accredited business analysis diploma program, as well as proprietary methodologies. She is also an international speaker and author of Managing Business Analysis Services: A Framework for Sustainable Projects and Corporate Success and Mastering Software Project Requirements: A Framework for Successful Planning, Development and Alignment. Darren Radford is President and CEO of Aspire, a management consulting firm, located in Vancouver, Canada, that offers a delivery focused and outcome-based solution capability to effect the right changes at the right time in the right way. Mr. Radford is a respected thought leader in the areas of business and IT strategy; portfolio, program, and project management; product delivery; stakeholder engagement; risk and quality; business analysis; and business transformation. His reputation was built on identifying innovative approaches to solving growth, productivity, and cost management challenges by transforming and evolving firms into high functioning organizations capable of sustainable success. Mr. Radford has over sixteen years of business and IT-enabled transformation experience in the commercial and government sectors."